JNTUK All University Examinations Scheduled on 11-08-2015 Are Postponed, JNTUK University Postponed the Exams Scheduled on 11-08-2015 Due to Ap State Bandh on 11-08-2015. AP Educational and all other Unions overall State bandh on 11-08-2015. Jntuk University Released the Notification About Postponement of Exams on 11-08-2015 Due to Ap State bandh Called By AP Student JAC and other Political Parties. and also Jntu Ananthapur Universities also Rescheduled their activities / Exams on 11-08-2015. So, As of Now in Jntuk Affliated Colleges JNTUK B.Tech 1-1 R13, R10 Supplementary Exams Should Starts from 11-08-2015. But Due to Protests for Special Status for Andhra Pradesh All Educational institutes had taken a Decision to Declare a Postponement of all Activities on 11-08-2015. In this Situation JNTUK Postponed all the Exams on 11-08-2015 and Rescheduled. Reschedule Dates will Intimate later. 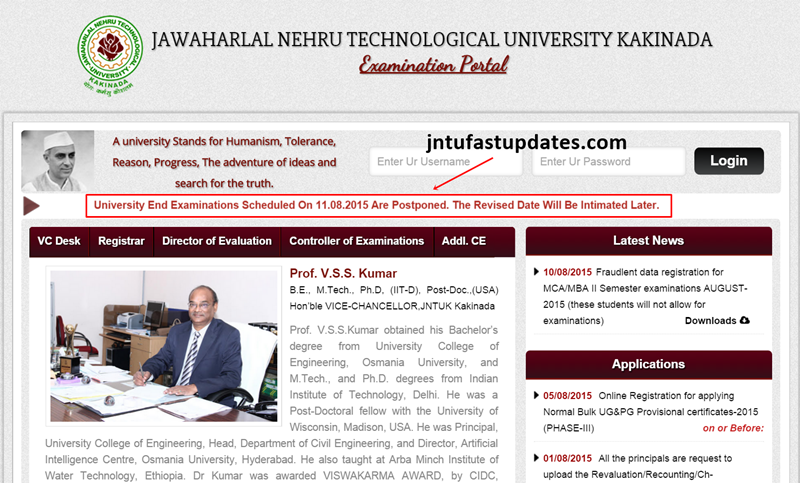 JNTUK University End Examinations Scheduled On 11.08.2015 Are Postponed. The Revised Date Will Be Intimated Later. sir plz send 2-1 results.